The Garfield Park Conservatory in Chicago, Illinois is one of the largest and most stunning conservatories in the nation. Often referred to as “landscape art under glass,” the Garfield Park Conservatory occupies two acres of public greenhouse space and 10 acres of outdoor gardens. Garfield Park Conservatory is located in Garfield Park — an 184-acre site located on Chicago’s redeveloping Westside designed as a pleasure ground by William LeBaron Jenney — serving as the centerpiece of the three great original Westside parks (Humboldt, Garfield, and Douglas). Thank you to the Chicago History Museum and the Chicago Park District for use of their Historical Photography. Following a devastating cold spell in the winter of 1994 which injured a significant portion of the aroid collection, the Chicago Park District convened a task force of representatives from various community, education, and environmental organizations. For six months, eighty individuals participated in the development of a plan to revitalize the Conservatory through new programs, visitor services, marketing and fundraising. These activities would be carried out by a newly formed Alliance, a partnership of organizations which included the Chicago Park District, Friends of the Parks, and area schools, museums, conservation organizations and community groups. The plan was subsequently funded by Lila-Wallace Reader’s Digest Fund’s Urban Parks Initiative which awarded a $1.46 million challenge grant. 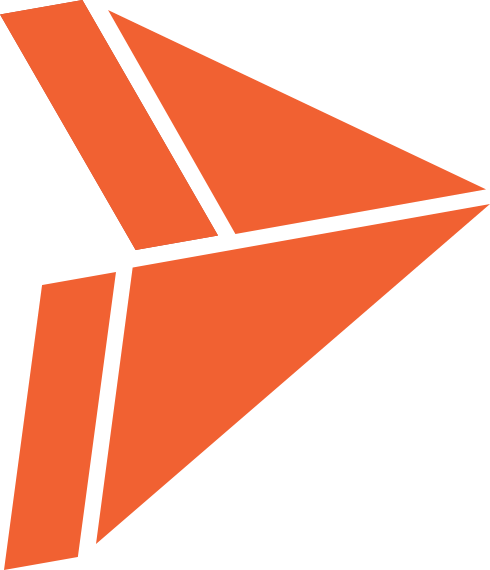 The grant required a one to one match, at least 60% of which must come from private funds. The Chicago Park District committed to the full 40% public sector match. 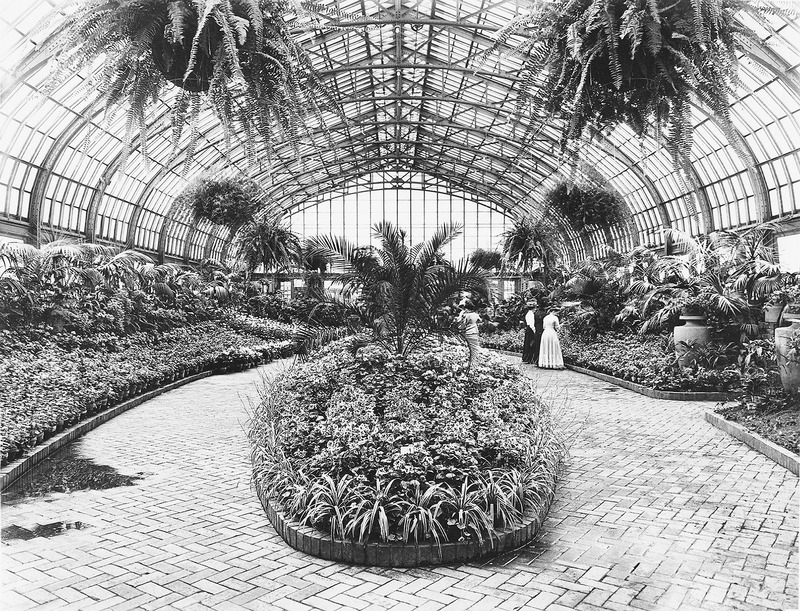 In the late 19th century, each of the three large West side parks had its own small conservatory and propagation greenhouses. After 20 years of use, these conservatories had fallen into disrepair and administrators believed it redundant to show similar plant collections in three facilities located within close proximity of each other. 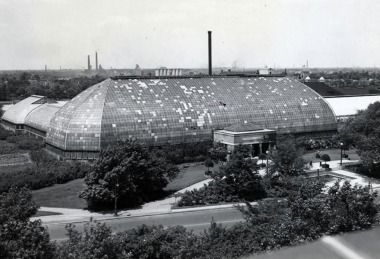 In 1905 Chicago’s West Park Commission’s general superintendent and chief landscape architect, Jens Jensen, demolished the three smaller greenhouses in Humboldt, Douglas and Garfield Parks to create what was intended as “the largest publicly owned conservatory under one roof in the world” in Garfield Park. Many of the original plantings came from the three earlier conservatories. Constructed between 1906 and 1907, and opened to the public in 1908, the Garfield Park Conservatory was designed by Jensen in collaboration with Prairie School architects Schmidt, Garden and Martin and the New York engineering firm of Hitchings and Company. It represented a unique collaboration of a prominent landscape architect with architects and engineers. Located in the midst of historic Garfield Park on Chicago’s West Side, the Garfield Park Conservatory is one of Chicago’s best kept secrets and one of the nation’s botanical treasures. It ranks among Chicago’s most unique sites, attracting visitors from a variety of cultures, disciplines and interests. Both Garfield Park and its conservatory are listed on the National Register of Historic Places. Over the years the Conservatory has been recognized as an internationally significant horticultural facility as well as a cultural asset to the surrounding community and the city of Chicago. This text is excerpted in part from Inspired by Nature: The Garfield Park Conservatory and Chicago’s West Side, by Julia S. Bacharach and Jo Ann Nathan. 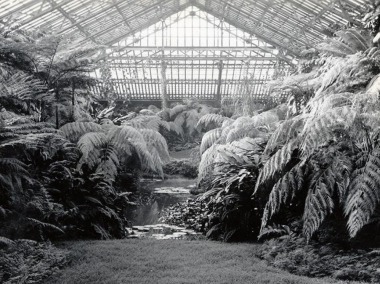 (top photo) Garfield Park Conservatory Fern Room, 1908, Courtesy of Chicago Park District Special Collections. The Garfield Park Conservatory sustained catastrophic damage in the June 30, 2011 hailstorm, shattering approximately half of the glass panes in the roofs of the historic Fern Room, Show House, and ten propagation greenhouses. The glass panes in the Desert House also sustained significant damage. The pathways, ponds and plants in the Fern Room, Show House, Desert House and propagation houses were covered with broken glass, and shards of glass hung dangerously from the roofs. The broken glass was removed, and the roofs of the damaged display houses were covered with temporary poly-carbonate sheeting to keep the plants protected and keep the environment inside the rooms steady until permanent glass could be installed. Extensive construction was needed to recreate the permanent roofs of these rooms. The damaged propagation greenhouses were repaired during the summer of 2012. The Show House repair was completed in July 2014. The Fern Room and Desert House were the last to be completed in early 2015. The Alliance and Park District celebrated the Grand Re-Opening with a large, free event featuring nature-based activities and exhilarating performances on Earth Day in 2015.